Apple released their annual report last night, and mixed in with the generally good news were a few misleading statistics. With revenues of $37.4 billion for the June quarter, Apple generated a profit of $7.7 billion dollars. Apple sold 35.2 million iPhones in the third fiscal quarter, up 13% from last year, and they sold 13.3 million iPads, down 9% from last year. In education, iPad remains the tablet of choice with 85% share of the U.S. education tablet market according to the latest published estimate from IDC. We’ve now sold 13 million iPads to education customers globally. While that is strictly true, it's not the complete story. Yes, Apple leads the academic market for tablets, and schools are buying tablets by the truckloads to equip classrooms and launch 1:1 programs. But not all schools are buying iPads to give to students; they're also buying laptops, including Chromebooks. Google has been interested in the educational market since 2011, and their primary focus is on a type of laptop called the Chromebook. Chromebooks run ChromeOS on what would best be described a cheap laptop hardware (although there are a few premium models like the Pixel) with an Intel CPU. Google has a number of hardware partners, including Acer, which lead the pack with 30% of the Chromebook market last quarter. Google has been so focused on laptops that they only belatedly added tablets, including the Nexus 7 and the Samsung Galaxy Tab, to their Google for Education program in November 2013. Given how Chromebooks and iPads are used in schools, they are direct competitors. So while Apple is dominating the educational tablet market, that is only because one of their leading competitors for school district dollars isn't focused on tablets. Google reported a few days ago that they sold a million Chromebooks were sold to schools last quarter (another 800,000 were sold to consumers). While that might not look nearly as impressive as Apple's 13 million iPads, the numbers suggest that Google could be selling as many Chromebooks to schools as Apple is selling iPads. We don't have specifics on how many iPads Apple sold to schools last quarter, we do know that Apple last reported in February 2013 that they had sold 8 million iPads to schools around the globe. A quick back of the envelope calculation tells us that schools bought 5 million iPads in the 17 months since February 2013, which means Apple averaged under a million iPads sold to schools each quarter - an average which is less than the million Chromebooks sold. So while Apple may be dominating the education tablet market, they're not dominating the larger educational gadget market. And that is the real story here, and it comes as no surprise. Based on what I saw at the Computers in Libraries conference a couple months ago, Chromebooks are getting a lot more buzz in edtech at the moment than iPads. Clearly that has translated into sales. For example, only today a school district in MD announced that they would be spending $15 million to buy 40,000 Chromebooks. But will it continue? I think so. Chromebooks are cheaper, they are supported by educational publishers, and iPads are great but they lack keyboards, which limits what you can do with them. With analysts predicting 5 million Chrombooks sold by the end of the year, I am expecting that Chromebook sales will outpace iPad sales for at least the next year and possibly even longer. Have you used a Chromebook? What did you think? So Kindle Unlimited Gives Traditionally Published Books an Advantage – What Else is New? 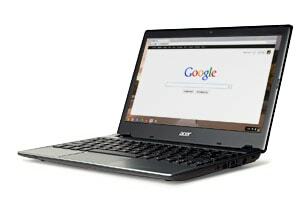 Our local scools in N. Calif. are talking a lot now about supplying all elementary schools students with their own Chromebooks to help facilitate a) Teaching general computer literacy/typing skills, and b) Daily coursework and assignments rather than using shared desktops (usually 5 or 6 for a class of 22-26 students). The key selling factor is they are portable for homework and the low cost , around $199 in bulk purchases. I can’t argue with this logic as they are good beginner systems and they get the job done. Intel and ARM not AMD, not aware of any AMD based Chromebook so far but let me know if you are since it wouldn’t hurt to have a better GPU. Another point to make is that Chromebooks are yet to spread to many markets so there is significant growth potential. I thought I read about one with AMD, but I could be thinking of ARM. I’ll remove it and double check. It’s not misleading. Chromebooks are not tablets, they are laptops. I don’t think it accurately states Apple’s position in the market. Hardly surprising. You get a keyboard with a tablet (are these things touch-screen too? ), and a touch-pad, and it’s half the price. Duh. I’m tempted to pick one up myself and install Android / Linux on it. The only issue for me is if the applications available are suitable. I own a Chromebook (HP 14) and absolutely love it. I’m only scratching the surface as to what it can do, but for the base needs of writing (via Google Docs) and web surfing, it’s perfect. Without a doubt, I can see the potential for educators using the Chromebook and that it would be a superior experience to the iPad. If you do any web-based work in your life (and have ready internet access), a Chromebook is worth looking at. Yes, the WiFi access is the tricky part, but there are plenty of offline apps to use. I have an iPad 3 and an Acer Chromebook. I use the Chromebook way more because I can use Google Apps for completing assignments. Read books in Kindle Cloud reader and do anything I could do on a laptop or a tablet and on top of that it boots in 8 seconds. This post seems to assume that schools are buying evenly over the year. I have moved almost entirely over to ChromeOS. I have a Samsung ARM chromebook and an Asus Chromebox, hooked up to a 32″ tv for a monitor. I have found there is little I can’t do on this set up – sometimes its done differently than what you would do in Windows or MacOS, but it gets done and often times easier and quicker. I do still have an old Windows box that I am using for a few apps that I haven’t migrated to ChromeOS – QuickBooks, Evernote for the occasional edit that can’t be done on the web, some PDF editing, although that is almost entirely available on the web now and for using a trusty cheap HP1000 printer through Google Cloud Print. I have an Epson All In One that lets me print from Chrome over the internet and scans directly to several “cloud” destinations – Google Drive, Evernote, Dropbox. Windows is quickly being relegated to obscurity in the house. My brother-in-law loaned me an HP 14-inch Chromebook, and I’m hooked. The most important factor for schools, I would guess, is the easy maintenance. No updating, no bug fixes, no viruses, no disk crashes. A kid breaks his Chromebook, you just give him another. He or she can set up their account and be back online within minutes. I’ve been using the Chrome browser extensively for the past couple weeks. A lot of its quirks bother me, so I don’t think I could switch to ChromeOS.